According to Maslow the concept of motivation entails the idea that higher human needs should spark a productive evolution. Those who are internally motivated are more likely to accomplish more than those who rewarded only by externalized rewards. Through job characteristics model it is possible to theorize how employers can make adjustments that encourage higher levels of work effort and development. 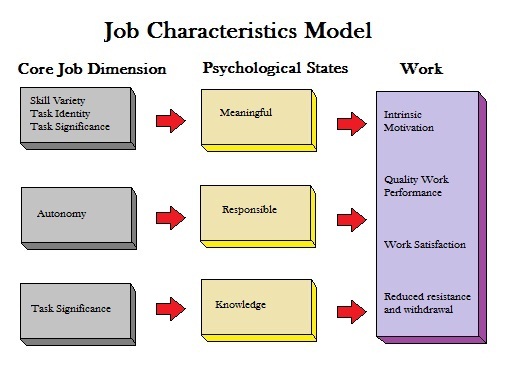 The job characteristics model seeks to explain how jobs can be designed to encourage intrinsic motivation Organizational Behavior researchers Richard Hackman and Greg Oldham tried to create higher levels of performance through redesigning jobs (Kinicki & Kreitner, 2009). Their goal was to create higher psychologically motivating states through specific job adjustments that lend to higher levels of performance. 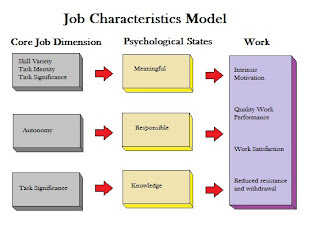 Accordingly, through the job characteristics model it is believed that task identification leads to higher levels of motivation. This identification occurs when workers identify with the tasks and believe them to be both worthwhile as well as part of their identity within their work function. Higher levels of task identity lead to higher levels of intrinsic motivation. When employees feel their work is meaningful this encourages task-specific motivation and further encourages the attainment of work goals (Barrick, Mount, & Li, 2013). It is this sense of purpose and contribution that encourages beneficial psychological states within workers. The higher their positive psychological emotions and feelings the more motivated they will be to improve upon their effort and attainment of goals. -Skill Variety: Variety of skills being used to complete tasks. -Task identity: The ability to take ownership over a specific part of a task they can claim as their work. -Task Significance: The extent to which the task influences and helps others. These three aspects are further enhanced by Autonomy and Feedback. Autonomy helps a person to feel as though they have the freedom to determine the scheduling and manner of work being conducted. Feedback allows a person to gauge their performance through the accurate feedback of others. Employees who master certain skills eventually want to make decisions on those tasks which lead to higher levels of innovative improvement. Intrinsic motivation can be seen influenced by the three positive psychological traits of meaningfulness, responsibility and knowledge (Hackman & Oldham, 1980). Employees feel their work is meaningful; they experience responsibility for the outcomes; and enjoy gaining knowledge about the work and its outcomes. When these three aspects are together employees will have positive feelings that further their motivation do better work. Employees who are externally motivated will be dependent on financial and social benefits related to their work status. If they do not find inherent personalized value in their work they will be focused primarily on externalized results. Externally motivated employees will lack task commitment and may give up when such external rewards are not forthcoming. Employers have a natural benefit in encouraging employees to develop internal motivation. Sometimes it is this feeling that a job done well is the best feeling in the world. Those who are externally motivated used externalized feedback to maintain their motivation. Without that motivation they will lose much of their work steam. Most likely people have a mixture of internal and external motivational factors that keep them going each day. Research has shown that internally motivated people enjoy their work more often and develop further than externally motivated members. Even without the social praise and benefits coming from others they keep learning, working, improving and developing day in and day out. These are the type of employees that will help an organization through tough times even when they have no reason to do so other than the sheer satisfaction of doing so. If employers can develop and encourage this motivation through job design and environmental adjustments they have a strong incentive to do so. Barrick, M., Mount, M. & Li, N. (2013). The theory and purposeful work behavior: the role of personality higher-order goals, and job characteristics. Academy of Management Review, 38 (1). Kinicki, A. & Kreitner, R. (2009). Organizational Behavior: Key concepts, skills & practices (fourth edition). McGraw-Hill Company.